I love pasta and vegetables, especially when they're combined together. 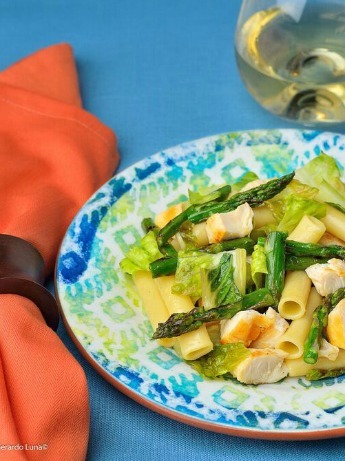 This guest-post recipe is courtesy of Pasta Fits. I think it would be perfect for lunch or dinner and looks really easy to prepare. I will have to head on over to our local farmer's market next weekend and pick up some romaine hearts, asparagus and fresh lemons. Now that the summer heat is kicking into high gear, it's the perfect recipe for you to make using your bbq grill. I am always looking for more recipes that combine protein with veggies and are healthy as well as rather easy to make.